A very windy day saw little change with the Pectoral Sandpiper still on Gretchen, the Red-backed Shrike still at Dennishill and the Common Rosefinch in Kirbest crop; there were however now two Hen Harriers and a Merlin hunting across the island and a Green Sandpiper on Kirbest scrape. Leftover migrants on the land included a Whinchat, a Whitethroat and 7 Willow Warblers while 65 alba Wagtails were scattered around while 3 Sooty Shearwaters and a single Manx Shearwater passed the north end. The wind slowly increased through the day becoming pretty foul by the evening but before things became too bad there were some new birds of note including a Barred Warbler near Ancum (very nearly a blank August for this species! ), a Black Redstart and an out-of-the-blue flock of 14 Crossbills which were caught together in one of the Heligoland traps late afternoon - our first since a lone juvenile on 5th August. A good selection of lingering birds also kept things interesting with the juvenile Pectoral Sandpiper still on Gretchen, the Velvet Scoter still in Nouster Bay and the Common Rosefinch still in Kirbest crop along with small numbers of common migrants including Garden Warbler, Whitethroat and Whinchat. A nice calm day with some overnight rain produced a good variety of birds across the island; our sixth Pectoral Sandpiper of the year turned up on Gretchen Loch - this time a juvenile, a female/immature Velvet Scoter was also new in Nouster Bay - a good island scarcity, the Red-backed Shrike from a few days ago reappeared at Dennishill and the Greenish Warbler, last seen in the hand on 26th also reappeared, again in a mist net at Holland House which, over the last three days had increased in weight from 6.7 to 9.1g - a massive 35.8% gain! Other migrants included a Collared Dove, three Whinchats, a Lapland Bunting, single Lesser Whitethroat and Whitethroat and a good total of 555 Meadow Pipits which included visible migration and grounded birds. A morning seawatch produced the highlight of an adult Pomarine Skua along with 48 Sooty Shearwaters and 8 Manx Shearwaters. 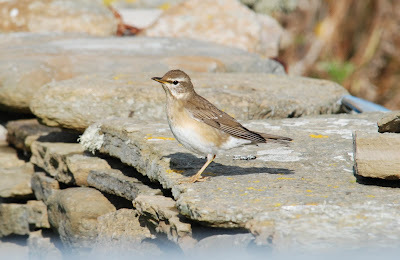 A very pleasant day with light westerly winds saw some interesting visible migration with counts including 420 Meadow Pipits and 136 alba Wagtails many of which passed south along the east coast of the island in the morning; also notable was an arrival of at least 150 Wheatears which also rapidly moved through. There were few new grounded passerines although the first Lapland Bunting of the autumn was at Kirbest along with a Common Rosefinch while there was still small numbers of Garden Warblers, Whitethroats, Willow Warblers and Blackcaps. Other notable counts included 175 Teal, 1,320 Golden Plover and 20 Black-tailed Godwits while a juvenile Hen Harrier floated around. 24 Sooty and 18 Manx Shearwaters passed the north end. 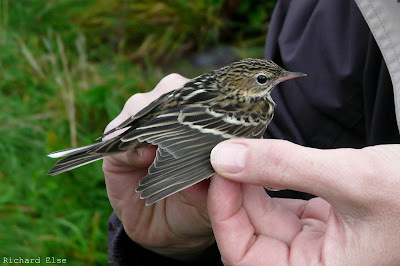 A quieter day with heavy rain in the morning and the winds switching back to the west; most of the notable birds were leftovers from the last few days with the Citrine Wagtail putting in several appearances through the day being seen near Sangar and at Brides Loch and the Grasshopper Warbler still skulking in Kirbist crop along with two Tree Pipits. Small numbers of common warblers were also seen including Lesser Whitethroat, Garden Warbler and Willow Warbler but again, these were probably lingering birds rather than new migrants. There was a good turnover of waders though, including good counts of 160 Dunlin and 204 Ringed Plover recorded with small flocks seen heading south overhead. Other assorted bits included a juvenile female Peregrine fighting with the local Ravens and single Curlew Sandpiper, Green Sandpiper and Common Sandpiper. A very successful ringing session at Holland House first thing saw the Greenish Warbler and yesterday's Nightjar both trapped; the morning also produced some more quality birds with a Red-backed Shrike found up at Dennishill and best of all a very mobile Citrine Wagtail initially seen up near the lighthouse but subsequently undertaking a tour of all the suitable spots being seen at Garso, Ancum and then Hooking. 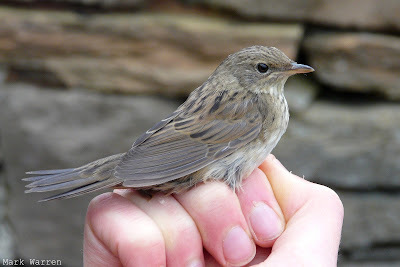 There was a scattering of common migrants across the island including a Common Rosefinch, a Grasshopper Warbler, 8 Whinchats, 6 Garden Warblers and single Tree Pipit, Redstart, Reed Warbler and Whitethroat while two Swifts passed overhead. There was also a notable influx of ducks and waders with two Pintail, three Tufted Ducks and three Shoveler in amongst 120+ Teal, 95+ Wigeon and 80+ Mallard while notable wader counts included 220 Sanderling, 1,350 Golden Plover, 170 Redshank, three Green Sandpipers and a Curlew Sandpiper. A look at the sea from the north end also produced a few birds, most notably 7 Red-throated Divers, 17 Sooty Shearwaters and 9 Manx Shearwaters. Greenish Warbler and Nightjar - a fabulous mist netting session! Today's frustrating weather was extremely thick fog from dawn but fortunately it cleared rapidly from late morning to leave a lovely sunny day with a fine array of migrants making the most of the warm afternoon; the highlights included a Nightjar, originally seen late last night near Sangar which had relocated to Holland House where it bounced out of several mist nets, the Greenish Warbler again at Caven, an Icterine Warbler at South Ness and a Common Rosefinch at Senness. The supporting cast was made up of a Grasshopper Warbler, 6 Whinchats, two Reed Warblers, 3 Whitethroats, 10 Garden Warblers, 17 Willow Warblers, 6 Pied Flycatchers and single Redstart, Blackcap and Lesser Whitethroat. Waders also passed through including 5 Greenshank, two Green Sandpipers and a Common Sandpiper. Heavy, persistent rain was certainly the order of the day, setting in early morning and not stopping until the early evening from when thick fog rolled in! Despite the weather, we put in lots of effort to cover the island, it was tough going but birds seen did include the Greenish Warbler still in the same area, 16 Willow Warblers, two Garden Warblers, single Whitethroat and Whinchat, an increase to 190 Meadow Pipits and three Swifts moving through; there were also 4 Red-throated Divers and a moulting adult Slavonian Grebe in Nouster Bay. The first birding guests of the autumn had more luck, putting in some seawatching effort and being rewarded with a Balearic Shearwater and two Little Terns in amongst small numbers of Sooty Shearwaters. A real autumnal day, murky and overcast with a strong south-easterly wind and fog which had crept in by mid-afternoon; there was some good variety in the arrivals today with the highlight being an elusive Greenish Warbler in a ditch near Howar which went missing several times for hours on end before reappearing in exactly the same spot again and again! The supporting cast consisted of 14 Willow Warblers, single Redstart and Whinchat, two Pied Flycatchers and an early Fieldfare. Also of note was an afternoon arrival of 45 Wigeon, a juvenile Kestrel, 5 Greenshank and a Green Sandpiper. 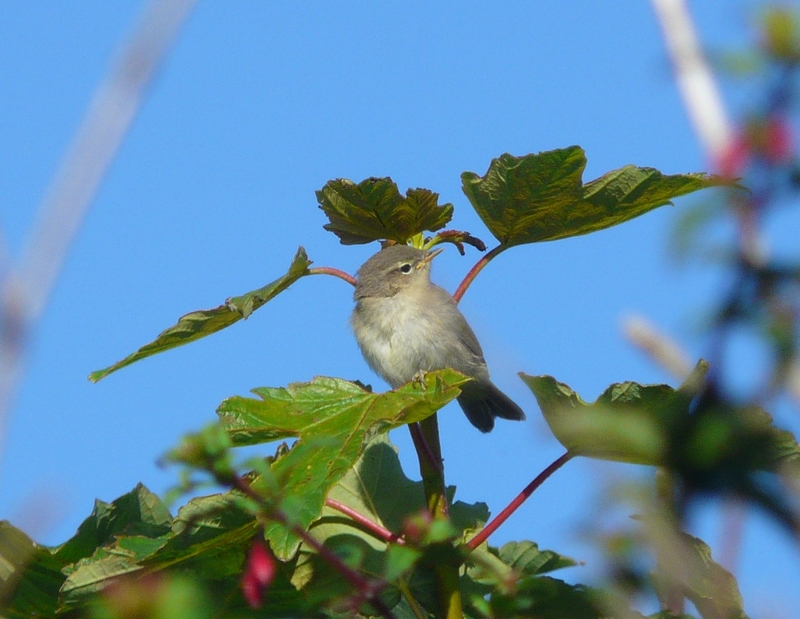 Definitely the start of autumn today, overcast with a brisk easterly wind adding a fair bit of anticipation to the daily census; new passerines as a result included an Icterine Warbler at Ancum Willows, a Pied Flycatcher at the Obs and a total of 9 Willow Warblers around the island. A fine summer plumaged Grey Plover was also new along with a good total of 40 Black-tailed Godwits consisting mainly of juvenile birds; another influx of ducks was also noted with counts of 61 Teal, 83 Mallard and 9 Shoveler. Due to a couple of recent cancellations we have a few rooms available for the first two weeks of September as well as some availability in the exciting month of October. Join us for these peak periods when there can be great birding, some impressive falls and incredible visible migration when anything can and often does turn up!! A promising day with light easterly winds was somewhat marred by thick fog which rolled in mid-morning; there was however, some signs of autumn passage with a Reed Warbler at South Ness, a Common Redpoll at Kirbist, an increase to 63 Wheatears and 60 alba Wagtails which included at least 16 White Wagtails. A look at the sea in the morning before the fog appeared produced another 7 Sooty and 21 Manx Shearwaters, the first four Great-northern Divers of the autumn and 21 Teal passed by. 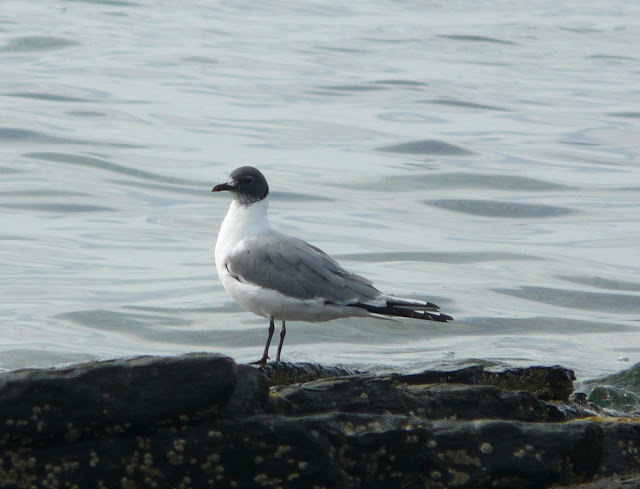 A count of 26 Lesser Black-backed Gulls was the highest of the year so far. The sea got a good few hours attention through the day where totals included 28 Sooty and 91 Manx Shearwaters along with nearly 300 Kittiwakes which comprised quite a few juveniles. There was also some passage noted through the day with 28 Black-tailed Godwits seen heading south and 24 Wigeon appearing on Ancum in the afternoon while the totals of 220 Dunlin and 34 Knot included birds seen coming in across the sea from the north. Landbirds were also on the move with Swallows, Meadow Pipits and alba Wagtails also seen coming in across the sea. 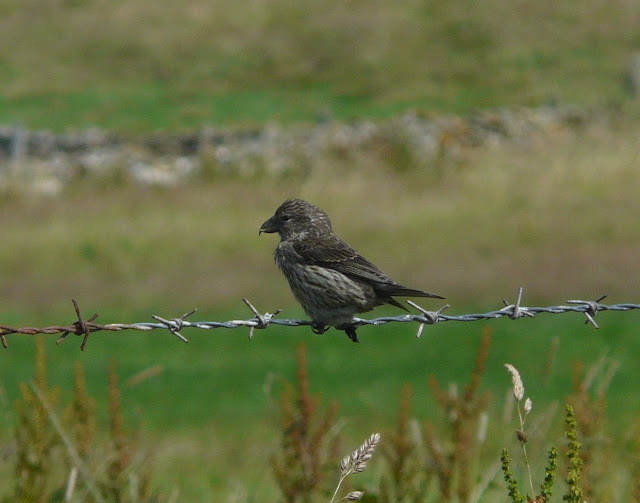 The day's highlight came late in the afternoon when a cracking juvenile Two-barred Crossbill was trapped in one of the Heligoland traps at the Observatory - it was quite a relief to finally get one of these lovely finches with birds both to the north and the south of us for weeks now! The sea also got a lot of attention today with the wind gradually dropping after yesterday's big blow with a few hours producing totals of 15 Sooty Shearwaters and 17 Manx Shearwaters along with a 1st summer Little Gull and a group of 5 Pintail in amongst the 1,100 Fulmars and 200 Gannets. Passerines have been slow to get going so far this autumn so hopefully the Black Redstart at Senness and Whitethroat at Rue are the start of things with the winds changing later this week. There was also another arrival of waders today with 253 Dunlin and 28 Black-tailed Godwit the most noteworthy while the Pectoral Sandpiper remains on Ancum Loch. An horrendous day with a blazing westerly wind and driving rain - the term 'unbirdable' was thrown around on a regular basis; we did get out though and birds we managed to see included more new ducks with 14 Wigeon and three Gadwall new alongside the Mallard, Teal and Shoveler and another influx of waders with 24 Black-tailed Godwits, 125 Ringed Plover and 165 Dunlin noteworthy. The Pectoral Sandpiper was still on Ancum and there were two Common Terns sheltering at the north end - an adult and a juvenile. There was little to mention on the 16th although the usual daily turnover of waders has now started to include the first juveniles of many species with the high arctic breeding species such as Sanderling, Knot, Turnstone and Bar-tailed Godwits appearing now; the rarest bird though - considering the very poor recent breeding seasons in the Northern Isles, was a juvenile Kittiwake which drifted down the west coast! Two Sooty and three Manx Shearwaters passed the top end in the morning of the 17th before the increasingly strong winds and spell of very heavy rain at lunchtime drove us indoors; the heavy rain produced a noteworthy arrival of ducks with the numbers made up of 95+ Mallard, 50+ Teal, 12+ Shoveler, two Pintail and 4 Wigeon while the quality consisted of a very smart female (probably an adult) Blue-winged Teal, it posed well but briefly on Ancum Loch before flushing across to Hooking from where it was seen to head high off to the south with some Shovelers - the first record for North Ronaldsay for around 20 years. Also new in were 6 Black-tailed Godwit, a Common Sandpiper and an influx of 60+ Snipe while the Pectoral Sandpiper reappeared on Ancum in the evening. There were 8 Sooty and 6 Manx Shearwaters offshore on 14th while on land the pick of the birds consisted of a Merlin, 7 Ruff, a Common Sandpiper and two Swifts; it was also quiet on the 15th with a Garden Warbler trapped at Holland House first thing followed by a young female Peregrine, two Greenshank and 8 Herons which flew south in ones and twos through the day. A juvenile male Peregrine produced most of the interest on 12th being seen all over the island from fighting with an Arctic Skua over the Obs to chasing Rock Doves over Ancum; other birds included the Pectoral Sandpiper still on Ancum Loch, a single Willow Warbler and the juvenile Hen Harrier still floating around. A bit more variety on the 13th saw a Cory's Shearwater pass the seawatch hide at 09:25 along with 5 Sooty and 3 Manx Shearwaters in a two hour watch; there was also another influx of waders with a steady stream of c200 Redshanks seen through the day along with increased counts of 60 Purple Sandpipers and 448 Turnstone while 37 Teal and two Black-tailed Godwits were also of note. The year's fifth Pectoral Sandpiper was on Ancum Loch on the 10th (although its possible that it could be the same individual that was seen three weeks ago?) while other birds included the first dispersing juvenile Merlin of the autumn, a Hen Harrier, a high count of 1185 Golden Plover, a new Garden Warbler and a Pintail with a small influx of 17 Teal. The Blue-headed Wagtail family have now split up with two juveniles still with the parents at Ancum while another two have spread their wings and made it to Westness. A quieter day on the 11th saw the Pectoral Sandpiper still present while 6 Sooty Shearwaters passed offshore and three Swifts and a Sand Martin passed over the land. A fun afternoon was spent on the 10th with three teams spreading out around the coast to ring the Fulmar chicks that are rapidly growing; around 180 of the foul smelling, balls of fluff were found - a higher total than the last few years. A quiet couple of days with Storm Petrel ringing taking priority with 120 caught over the last two nights in the calm conditions; other birds included 4 Ruff again while 6 Swifts and two House Martins passed through on the 7th and a group of 6 Herons, a Common Redpoll and single Wood Sandpiper and Greenshank seen on the 8th. There were 4 Ruff, 15 Black-tailed Godwits and 11 Whimbrel amongst reduced wader numbers on the 5th when there were also 13 Swifts lingering over the Obs, the first two Sand Martins of the autumn and a juvenile Crossbill, also at the Obs. A quieter day on the 6th produced another 10 Swifts overhead, two flyover Crossbills and an adult Blackcap trapped at Holland House - the first returning bird of the autumn. We also finally confirmed that the over-summering Chiffchaffs at Holland House have indeed bred with the appearance of several still-fluffy juveniles, the first breeding record for North Ronaldsay! Seven Swifts flew south on the 3rd while the first returning Common Sandpiper was found before a late afternoon seawatch produced two Sooty Shearwaters, 33 Manx Shearwaters and 7 Storm Petrels. The 4th produced a wider variety of early autumn migrants with a juvenile Hen Harrier, a Kestrel, a Common Redpoll and 5 Swifts seen across the island. There was also another notable influx of waders through the day with 35 Black-tailed Godwits, two Green Sandpipers, a Ruff, 9 Whimbrel and at least 955 Golden Plover the highlights while the Arctic Tern flock around Bewan increased back up to 2800+ birds with two Common Terns picked out amongst them. The breeding pair of Blue-headed Wagtails were still present at Ancum with at least one juvenile in tow. The sea provided most of the notable birds on the 1st with a couple of hours late morning producing a Sooty Shearwater, 17 Manx Shearwaters and at least 30 Storm Petrels while a late brood of seven tiny Tufted Ducks appeared on Brides Loch. Passage waders were in evidence the following day with the first two returning Greenshank and the first Ruff of the year seen with two Tree Sparrows new at Holland House and a Red-throated Diver also of note. Juvenile Sedge Warblers have also started to appear in odd places over the last few days - presumably locally bred birds but it won't be long before migrants start to turn up. Dunlin numbers increased again to 362 on 30th, with a few more juveniles joining whats been almost exclusively adults so far. There were also 3 Black-tailed Godwits, 294 Sanderlings and a juvenile Sheluck seen. A Crossbill was seen near the airfield in the evening with at least 2 seen on 31st. Also that day, a Black Redstart near Nouster was a surprise and a Pintail was on Ancum Loch. This was 1 of at least 2 Crossbills seen on 31st, the other had quite pronounced wing-bars! However it was only seen briefly but was still thought to most likely be a 'wing-barred' Common Crossbill, rather than a Two-barred Crossbill. 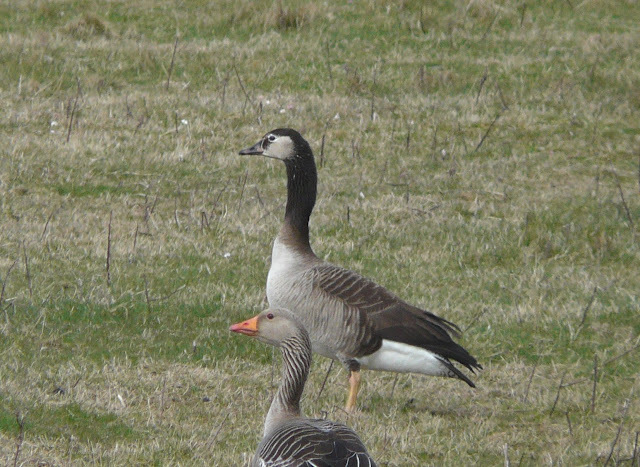 ﻿After being absent since the end of April, our hybrid Goose has returned-Joy!